Via Meskel Square I learned of the Africa Reading Challenge created by the blog Siphoning Off a Few Thoughts:Participants commit to read - in the course of 2008 - six books that either were written by African writers, take place in Africa, or deal significantly with Africans and African issues.Participants will write about the books on their blogs and a list with links will be (well, is already being) kept at Siphoning Off a Few Thoughts. Nita and I first met in Kenya in December 2006, and then I got to read at the Sunday Salon this past February. We realized then that we hadn't had much chance to chat, so we went out for tea one day, and Nita kept asking me questions about science fiction. She apparently found my answers in some way or another interesting, and asked if we could try to replicate our conversation via email. And voilá, an interview! The Writing Program presents Katherine Min reading from Secondhand World and discussing her work with Jackson Taylor, associate director of the Writing Program. $5; free to all students and New School faculty, staff, and alumni with IDI'll be there (fashionably late, I expect), as will all my imaginary friends, and perhaps even a few of the not-quite-imaginary ones. "The most desperate of all writers"
VictorShklovsky, from Energy of Delusion: A Book on Plot, translated by Shushan Avagyan:In the long story "My Life", Chekhov wrote about a bad architect who designed buildings so badly, planned the interiors so poorly, the facades were all so hideous that people simply got used to the style of this person. The style of failure becomes the style of the town. Chekhov hated expositions and denouements; he is the one who revived the two concepts. I'll repeat once more about how he wrote to his brother saying that the plot must be new and a story isn't always necessary. By plot he meant the false theatre, the poetics of that theatre, especially the expositions and denouements of plays -- things that the viewer is anticipating with pleasure. It's like a shot of morphine. Literature became a place of false denouements, false expositions, false successes, the successes of individual people. 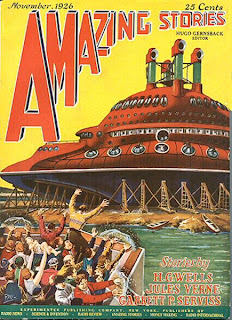 Through a bit of luck, I was able to get a copy of the November 1926 issue of Amazing Stories (vol. 1, no. 8) for an affordable price (because it's not in very good condition). I've wanted to see a complete issue of one of the early, Hugo Gernsback-edited Amazings for ages -- yes, aside from the material they reprinted from Wells and Verne and Poe, most of the fiction they published was atrociously bad and even occasionally illiterate, but Amazing as an idea and institution was an important step in differentiating science fiction from other types of writing. 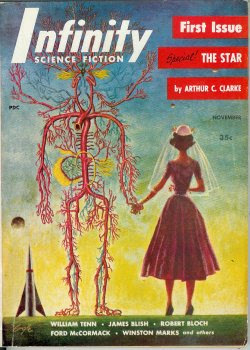 As is being widely reported, Arthur C. Clarke has died. He was a unique and remarkable man, one whose influence and importance was felt in numerous fields. It's been years since I read any of Clarke's fiction, and it never had the deep effect on me that the writings of some of his contemporaries had, but his novelization of the movie he helped imagine, 2001: A Space Odyssey, was one of the first SF books I ever tried to read, since it was just about the only SF novel my parents owned when I first got interested in such writing. I saw the movie soon after, and though I found it utterly bewildering and sometimes soporific (I was more used to things like Smokey and the Bandit at the time), it piqued my interest, and later viewings grabbed hold of my imagination in a way few films ever have. I first learned of Nicholson Baker's new book, Human Smoke: The Beginnings of World War II, the End of Civilization, when I saw Ed Champion carrying around a well-worn galley copy at a reading a month or so ago. It looked like the kind of book I could become obsessive about, and so I contacted the publisher and begged for a copy, and soon a finished copy (beautifully made) of the book had landed on my doorstep. I'd only read a few pages when Ed invited me to join an online roundtable discussion of the book he was putting together. 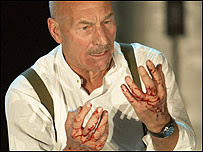 My yearnings for theatre were sated last week when, through luck and happenstance, I got to accompany friends to two of the most talked-about shows in New York at the moment: Sunday in the Park with George at the Roundabout Theatre and Macbeth at the Brooklyn Academy of Music. As events and opportunities to spend time with friends, both were completely pleasurable. As aesthetic artifacts, both were disappointing. Franz Kafka's editor:The story is true. Kafka simply wrote a completely verifiable, journalistic account of a neighbor by the name of Gregor Samsa who, because of some bizarre medical condition, turned into a ‘monstrous vermin.’ Kafka assured us that he’d made the whole thing up. We now know that to be completely false.I wonder if Penguin will offer me a refund for the new Michael Hofmann translation of the stories that I bought a few days ago? Meanwhile, some of my super-secret, oh-so-influential, don't-you-wish-you-were-as-connected-as-I-am-nah-nah-nah-nah sources within the publishing industry tell me that Mark Leyner'sMy Cousin, My Gastroenterologist, will soon be revealed to be not a memoir of a family's amusing exploits down digestive tracts (as we've all thought for years), but rather a microeconomic study of the effects of household income as a determinant of natural gas consumption. Keep your eyes out for further revelations!